Canadian Thanksgiving may have past already, but that doesn't mean that we stop being thankful for what we have. I try and remember why we are thankful throughout the rest of the year as well. We like to entertain at all times of the year and often have friends over for dinner. Things can sometimes get messy, and Oxi-Clean has saved my table cloth more than once in the past. Now, it can help with the dishes also! Sarah Baeumler from HGTV has some fantastic tips for you - keep reading to find out! • Simplicity is key: When it comes to decorating, less is more! Over decorating is time-consuming and leaves your home feeling cluttered. A simple look will brighten your space and leave more room for mingling. • Seasonal Florals: Fresh flowers on the dining table are a must, though one large centerpiece isn’t always the best choice when entertaining guests. Dial up the holiday spirit and leave more space on the table for turkey using smaller, in-season floral arrangements with fruit and vegetable accents to decorate your table instead of an oversized arrangement. • Warm welcome: Start impressing your guests before they even walk in the door! Take your holiday colour scheme outdoors and set a welcoming mood with lavish greenery adorned with seasonal décor such as leaves and pine cones. • Switch up your colours: Branch out from your traditional Thanksgiving colours and choose a colour palette reflective of your style. Using all white or different shades of white can help to keep your look clean and crisp. Or, add a festive shimmer with copper, silver or gold accents. • Overnight guests: Soft white linens and duvets for your guests will make them feel like they’re staying at a luxurious hotel. 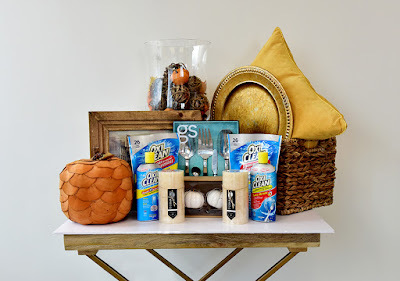 Keep a basket with white towels and toiletry items they might have forgotten, like toothbrushes and toothpaste, for an added touch of elegance. • Outdoor décor: To revive last year’s décor and keep it looking new, use OxiClean™ Versatile Stain Remover Powder. It’s the perfect solution to remove dirt, dust and grime from decorations that were sitting in storage or outside throughout the fall. • Dress to impress: Don’t shy away from wearing your favourite party dress for fear of spills and stains. OxiClean™ Liquid Laundry Detergent keep your clothes looking vivid and bright and remove any dried-on stains the first time. • Attack spills and stains: There’s always a risk of spills and stains at any social gathering. Be prepared for a spill to happen by mixing OxiClean™ Versatile Stain Remover Powder and warm water in a squeezable bottle before the party starts but make sure not to seal the bottle and to discard the mixture afterwards. • Get the kids involved: Having the kids set and clear the table gives adults some time well-deserved down time. Don’t stress about their scraping and rinsing skills, OxiClean™ Extreme Power Crystals™ Dishwasher Detergent and Triple Action Dishwasher Booster will remove the toughest stuck on foods and stains to keep your dish and glassware sparkling clean and free of debris – no pre-rinsing or pre-washing necessary! • Linens and Towels: To keep white linens brilliantly white and looking their best for your guests, use OxiClean™ White Revive™ to get tough stains out the first time. To keep colourful towels vivid and bright wash-after-wash, use OxiClean™ Liquid Laundry Detergent. I had no idea OxiClean now had a lineup of products for the dishwasher! The OxiClean™ Triple Action Dishwasher Booster supercharges your detergent to remove cloudy film, food particles, spots and streaks for a crystal clean in every wash. They also have dishwasher tabs available to clean your dishes. The high-efficiency formula in concentrated crystal form contains oxygen and high performance enzymes to eliminate the toughest stains, stuck-on foods, cloudy film and odours for clean and sparkling clear dishes. Sarah and OxiClean want to help you prep for this holiday season and are offering Tales of Mommyhood readers the chance to win a Holiday Entertaining Prize Pack filled with OxiClean products, valued at $175.00. This giveaway is only open to Canadian residents that are 18+. Complete the giveaway tools form below to enter. This will run from October 22, 2015 until 1159pm EST November 1st, 2015. Tales of Mommyhood received compensation for this post; all opinions are honest and belong to ToM. Your opinion/experience may vary. I like to have everything prepared as much as possible. Pretty containers are great to keep things sealed. Lovely decorative pieces can be picked up cheaply at a discount dollar store. No need to spend oodles of money. Make food ahead as much as possible. That way it's less stressful. I like to get as much done before the guest arrive. Preplan, preplan, preplan!!!!! Things are less stressful if you plan in advance what you are going to make, make a shopping list and buy all ingredients in advance based on the list therefore everything is ready. Prep ahead and ask for people to bring a dish as well so it's not all on you. I like to have quick snacks on hand like a cheese ball and crackers/fruit/candy so I can quickly assemble the goodies for my company during the holidays. I ask dinner guests prior if the have any food requests, allergies, etc. This takes away their worry, and makes me feel better as a host knowing everyone will be pleased with the menu! I like to have things ready when the company arrives. That way I can sit with them before dinner and spend some time with the grandchildren. I like to do as much ahead of time as possible and then relax for the celebrating! I need my list of what to do when! I try to keep it simple...but prep and clean up never are. I like to keep a fresh bouquet of flowers on our bathroom counter in the main downstairs bathroom. Flowers are nice to have, but always take up too much space on the table as a centerpiece. Almost every guest will use the bathroom at a get together, so it is a nice pleasant surprise to see fresh flowers in an otherwise pretty boring room. Do as much baking/cooking ahead of time, so you can enjoy time with your guests and not be panicking in the kitchen. Mine is to do all the prepping and hard work the day before so I have more to to be with company and not stuck in the kitchen!! I usually buy multiples of one hostess gift so that I don't have to worry about it all the time. My best tip is to precook as many goodies and food in the days before your guests come as your can! Then you're not spending all your time in the kitchen! I suggest a potluck for the holiday dinners. As host we make the big stuff like turkey and roast, and have guests bring something to share. Have mainly finger foods when hosting...less stress of having to cook, and will yield more variety. My tip is to prepare in advance and enjoy yourself and your guests. Display your family photos with holiday trimmings. Have a potluck and designate certain dishes to individuals so less stress is involved on your end and people feel included! Prepare as much food in advance so that you are not rushing to get everything done. I like to freeze cranberries in ice cubes for punch! Have an easy menu and prep as much as you can the day before! Do the prep work well in advance and make sure some mood music is playing to enhance the atmosphere. I like to do as much prepping early in the morning so the rest of the day isn't a rush. Make a list and do as much as you can the days before. Don't spend all your time in the kitchen! If your meal is too complicated, you won't be able to enjoy your guests! Ask for help, or make something easier, or do a potluck! My tip is to do a potluck dinner so the pressure is off you and shared equally among your guests. I have lots of lists to help me stay organized on when and what to do before the party. I like to bake and have finger foods, and desserts to pick at.I put out bowls of mints, nuts and chips too. Lists, make lots of lists! Make a list of what needs to be done and when it needs to be done. Try to do things ahead of time like grocery shopping, cleaning and prepping the food. And the most important is to ask for help! Start preparing earlier in the week. Draft someone to help with the cleaning and cooking! Let everyone help ! the more hands doing the work the faster it will get done ! Make sure that you check in advance with your guests if there are any allergies or intolerance that you need to take into consideration. I prep as much as possible in advance, making sure that I have all I need for the day - including taking into account if there are dietary constraints. If someone offers to help let them don't try to be the only one helping. Clean a few days beforehand so you are not as stressed. Prep as much as you can before hand and remember to take time to enjoy yourself too! plan ahead and don't hesitate to write stuff down. My best tip is to not leave the cleaning for the last minute! Plan ahead and then relax. Friends will forgive any shortcomings as much as you forgive theirs. I'd have to say something I always have to remind myself: stop stressing to get everything "perfect". It's more important to enjoy the company and have fun! Just have fun and don't worry too much about what your house looks like. I like to plan and make a meal that requires little last minute fuss. I like as much done ahead as possible so I can be relaxed. Get your desserts done and prepped and frozen 2 weeks before so you can then relax as the holidays draw near and only have to worry about getting the main course done. My holiday tip is to prepare as much as you can beforehand so you can visit with your guests. Well before hand, make a list of everything that needs to be done and then plan those things according to your calendar. That way you will not be left with everything to do at the last moment. Personalize the place settings. Add a nice touch for your guests. Prep as much as possible ahead of time so that you can enjoy the festivities and the company as well! Prep ahead of time so you can enjoy your guests! Bailey Dexter I have the table set with dishes, tablecloth, cutlery, salt & pepper, centerpiece & what ever else I can leave over night! I prep as much food as I can the day before a big dinner. And also clean as I go, dont leave it all until the meal is over! I prepare as much food the night before as possible, and I make sure all of my shopping is done days in advance. I also make sure to clean up as much as possible during the week before! I like to use really elegant looking disposable dinnerware. There are some really nice ones out there. Put a pan of water with a few cloves, apple slices and cinnamon sticks in it on simmer for a few hours before your guests arrive to make your home smell nice for your guests. Also have as much done before your guests arrive so you are not stuck in the kitchen and you can visit with your guests. I love to keep packages of smoked salmon in my freezer. Along with rice crackers and capers, they are quick entertaining apps for unexpected guests! I like to use recipes that I can make ahead so that on the day of company coming over I have less prep. Prep as much as you can ahead of time. Go for potluck any time you can. I make lists. Lots of lists, lists of things I need to buy, do make, tidy & set up! Then I don't forget anything at all & I know exactly where I stand so I never run out of time getting stuff done before the party! Bake a casserole type dish and freeze it in case of unexpected company. Do as much ahead of time as you can and clean up as you go. Try to get things done ahead of time, and relax day of. Remember that these are your friends... they're not going to judge you if everything isn't flawless. Have a pot of mulled wine simmering on the stove, it makes your home smell inviting and you will have a warm beverage to offer your guests! Have lots of appetizers prepared and ready ahead of time! Always have treats and appies ready just in case! Also, crack out the holiday towels! One of my best entertaining tips is delegate chores and cooking as it makes it much easier for yourself. I like to bake way ahead for the holidays so that I am less stressed and can enjoy time spent entertaining guests properly. My favourite holiday entertaining tip is to prepare and prep before everyone visits so you can enjoy time with family. Plan as much as you can in advance. Nothings more stressful then running around last minute. Potlucks are an easy way to get lots of deliciously made foods and reduce the amount of food prep! Make a punch so you'll be able to sit back and enjoy your bash without having to play bartender. Plan and prep ahead of time. I love to do internationally themed potlucks! Prepare as much as possible ahead of time and be calm when guests arrive. My tip is to delegate cleaning tasks to family members. I learned over the years it is a lot easier to use paper plates and plastic cups so after dinner it is an easy clean up and you can sit down and enjoy your company. Cook your turkey the night before. The next day you can carve what you need for dinner and then prepare the rest for soup. I cook my turkey the day before and have it carved up and ready to reheat. I like to prepare as much as possible ahead of time so I can spend more time with my guests. Try to prepare as much of the food before hand. So when your guests show up you are not stuck in the kitchen the whole time. Do as much baking,cooking, preparing as possible the day before. Also if you have a special dish or dessert that you are serving, make copies of the recipe (if it's not secret) to give to guests when they ask for it. By the time I had my second child I wised up and started having Christmas Dinner on Christmas Eve.I could spend Christmas morning with my family in a leisurely manner.And all those great leftovers on Dec 25! An easy appetizer is just cream cheese with sweet chili sauce on top. Don't do everything by yourself. Get everyone to help out. Clean, organize, bake and do all prep work ahead of time. Let people help and children too. If everyone is included it can make for a really less stressful event. I get as many of my family and close friends pitch in with the preparations. I always make sure to leave out some paintings/pictures that my little ones have made throughout the year. Pictures etc. I always bake, and we are jam makers so everyone looks forward to that! Okay, so this tip is more cautionary and rational then fun... But if you are serving alcohol or hosting a large gathering, I would HIGHLY recommend acquiring a Special Events Insurance Policy with Liquor Liability; this coverage if for 1 or 2 days only and insures you against your guests suing you if they get hurt on your premises or if they are involved in a car accident and sue you for over-serving liquor. I love getting my older daughter involved in decorating and setting the table. She does such a great job, even better than I could do! My adult daughters are great partners in the kitchen now, so we all share the burden and have fun doing it! My best tip is to relax and not make it into a big production. People want to be there to visit and have fun; they don't come to be impressed by fancy decor and a flawless meal. Make sure restrooms are clean and well-stocked with paper products. And make more food than you think you'll need. My fave tip is: Dress to impress: Don’t shy away from wearing your favourite party dress for fear of spills and stains. OxiClean Liquid Laundry Detergent keep your clothes looking vivid and bright and remove any dried-on stains the first time. Does "not hosting a holiday event at all" count? What about "leaving the country". Sorry but that's what we do. Others ideas are fun to read. My favourite holiday entertaining tips are to prepare, make food ahead as much as you can and accept your guest's offer to help or bring food! Make your appetizers & do all your house cleaning before guests a day or two beforehand so you're not spending all your time in the kitchen when company is there. Too many times the hostess goes unseen because she's in the kitchen all night! Also have stacks of plates, silverware & napkins out so guests can serve themselves. Clean as you cook/ go/ whatever so there isn't a huge mess at the end that seems insurmountable! I like to stock up on easy to prepare frozen snacks for unexpected holiday visitors. leave out lots of decor around the house reminding everyone of how beautiful the season is. its always nice to walk into an place like that, also lots of candles so it smells nice. Make dinner a potluck so that you don't feel overwhelmed. Getting everything organized so I would have more time to spend with my guests. I like to have pot luck dinners as I'm not a great cook. I finish all my baking by December 18, and focus on other tasks. My favourite holiday entertaining tip is - have easy recipes to treat your guests fast. Make as much as possible the day before, plan to take a day off the next day for clean up and recovery! Make sure you have lots of non-alcoholic beverages on hand for the non-drinkers and the designated drivers. delegate what you can to your spouse. Use disposable everything for simple clean up! Plan ahead, ask for help when needed and relax often. Do your prep work in the morning, so you can relax and enjoy your guests later in the day! I would have to say PLAN AHEAD - are there food allergies you need to watch for? Have everything done ahead of time, Nothing worse than being stuck in the kitchen when you have guests. My favourite tip is to not leave anything to the last minute. Get as much done beforehand as you can. Getting it done the day before is even better! Always be sure to have everything done before family shows up to dinner at your home. Get as much prep work as possible done ahead of time. It sure saves time (and stress) the day your guests arrive. Make a plan so you know what can be done ahead and what is realistic.